Evidence of early occupation has been discovered in many areas surrounding Winscombe. Early prehistoric finds include: a Palaeolithic hand axe (c.200,000 B.C. ); animal bones on Sandford Hill, including lion from an inter-glacial period (c.40,000 B.C. ); a scatter of worked flints including arrowheads on Callow Hill; a polished flint axe found on the slopes of Crook Peak; and a late Bronze Age socketed axe discovered near the Trig point on Wavering Down. Further evidence of occupation includes: the standing stone at Wimblestone (c.3000 B.C. ); a Bronze Age barrow just outside the parish at Rowberrow (c.2000 B.C. ); Iron Age hillforts at Banwell and Dolebury (c.500 B.C. ); and Roman occupation at the villa site at Star and the settlement at Winthill, Banwell. In the post-Roman period, 400-700 A.D., before the Saxon conquest of Somerset in the late 7th century, hillforts such as Banwell were often re-occupied, certainly this occurred at Congresbury. The discovery of several skeletons in The Lynch, Winscombe in 1993 may indicate the position of an early Christian cemetery of this period. The shape of the parish is very irregular, which consists of a valley with limestone ridges to the north and south and the unusual shape of the area, defined by the boundaries, is probably the result of lands of various hamlets combined when granted in 975 A.D. It is roughly a figure of eight shape with: Sandford, Nye and Dinghurst in the north; a narrow boundary across the middle along the Towerhead Brook; and a larger area to the south containing Winscombe, Barton, Woodborough, Sidcot, Hale and Winterhead. The parish shape and boundaries remained the same for 1000 years until parts were cut off and added to Churchill parish in the 1930s. There have also been a few recent minor changes. Winscombe (presumably a valley belonging to a Saxon named Wine) is made up of many separate settlements. Between 959 & 975 A.D. King Edgar (of Wessex and then all England) granted Winscombe to Aelfswith, sometimes described as 'queen' but more likely a nobleman's wife. This manor was almost certainly granted out of the great royal or monastic estate of Banwell which was one of the most important Saxon estates in Somerset before 1000 A.D. along with Congresbury, Wrington and Brent. Aelfswith gave the 15 hide estate of Winscombe to Glastonbury Abbey almost immediately. So if we can assume that the 10/11th century estate of Winscombe was the same as the area of the ancient parish, then the early boundaries are those chosen to define the area in the 10th century. Certainly when Domesday Book was compiled in 1086 on the order of William I, Winscombe belonged to Glastonbury Abbey and consisted of 15 hides. 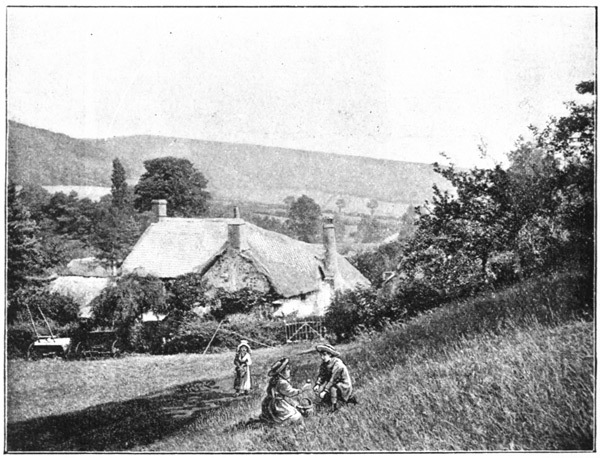 The Domesday entry for Winscombe includes: 3 slaves, 28 villagers, and 6 smallholders (probably indicating about 250 people); 1 mill, 8 cows, 16 pigs, 30 sheep and 31 goats. Winscombe remained a possession of Glastonbury Abbey until the 13th century when it was handed over to Savaric, Bishop of Bath and Wells, therefore, the Winscombe estate had belonged to Glastonbury Abbey for about 250 years. In 1239, after Savaric's death, Bishop Jocelyn gave the Manor of Winscombe to the Dean and Chapter of Wells Cathedral. Most of the boundaries follow streams, ridges on hills and old roads. The northern end of the parish is defined by the Towerhead Brook (west), Churchill Rhyne and Sandmead Rhyne (east) and the Liddy Yeo (north). The southern boundary follows the tops of the ridges of Callow Hill, Shute Shelve Hill, Wavering Down and Compton Hill nearly to Crook Peak. Almost on the boundary at the south west corner of the parish, Crook Peak has been important as a landmark and boundary from very early times, the name 'Crook' comes from Old British 'Cruc' meaning 'peak'. This boundary was there in 1067 - 'Hyrgges Tor' (Crook Peak) along the ridge, past 'Ealmes Fold' (possibly the site of Hill Farm), to 'La Scyte' (Shute Shelve) and on up to 'Calewe' (Callow-the bare hill). Of greatest interest are those features followed by the boundaries which are the result of human activity and here we can see something of the 10th century landscape. Lyncombe Lane, Shipham Lane and Leg Lane were probably all roads in the 10th century and have implications for the late Saxon communications pattern in the parish. Between the Shipham Lane crossroad and Towerhead Brook, in the centre of the parish, the boundary follows for a short distance the main north-south road from Winscombe to Sandford. Field boundaries are followed by the parish boundary at the western end below Crook Peak and between Uplands Cottages and Winterhead. Certainly near Winterhead the zigzag pattern suggests that the boundary merely went along pre-existing fields and boundaries. Topographical names such as Lyncombe and Oakridge are land names which do not provide evidence of people living there and it does not necessarily mean that the first mention of a place in a document is the date when it was founded. These settlements could have existed for hundreds of years before the first date recorded. Evidence for occupation can be taken from written sources including the 1290 Custumal of Winscombe, a document held in Wells Cathedral Library, listing the names of the settlements of Winscombe. The names of the tenants are also included as well as the rent, taxes and services due from each of them to the Lord of the Manor. Francis A. Knight's book, 'In the West Country', contains in the chapter entitled 'A Mendip Valley: Winscombe' this ancient illustration of The Church of St James . The dispersed settlements of the parish of Winscombe, with first dates for mention in documents include: Sandford (1189); Woodborough (1235); Max (1319); Ford (1189); Barton (1068); Winscombe (1086); Winterhead (1086); Sidcot (1235); Oakridge (1290); Hale (1235); Dinghurst (1189); Nye (1189); Lyncombe (1235); Knap (1290); and Shute (1067). We now know that some settlements were deliberately laid out in the early Middle Ages by landowners such as Glastonbury Abbey and in this parish this could include Winscombe, Sidcot, Winterhead and Barton. Documentation also provides additional information which helps us to build up a picture of the parish in the Middle Ages. The upland areas were almost certainly open common - Sandford Hill, Wavering Down, Callow Hill and Winterhead. These areas were not enclosed and farms were not built until after 1790. The best land could have been used for arable and also pasture in fallow years. The land was in strips, in some common fields, but it was not the well developed common field system that we learned about in school. The parish church at Winscombe was dedicated to St. James the Great in 1236 although it was almost certainly in existence long before that. It was probably first built in the 10th century when Glastonbury Abbey acquired the estate. It was built in a very odd position halfway up the side of a north facing slope. By 1290 a mill and smithy are mentioned: Maxmills with its long leat, pond and elaborate water-works looks like a Glastonbury Abbey scheme and, therefore, probably 12th century; another mill, Woodborough Mill, was at 'Mill Pond Cottage’; and there may have been another mill at Sandford on the Towerhead Brook. There was also a Medieval windmill on The Lynch. There is considerable documentary evidence for settlement in the Medieval period at Barton. The oak roof timbers at West End Farm, Barton, have been dated to 1278 by dendrochronology (tree ring dating). This building is a rare example of a true cruck construction standing in Somerset today. It is also likely to be one of the earliest recorded continuously occupied domestic buildings in England - a farmstead of a wealthy Winscombe peasant of the 13th century. Knight's book also contains the following illustration in the chapter entitled 'Hale Well - A Quiet Corner'. Click here to see the complete book. Map evidence suggests that Yadley Lane is one of the oldest roads in the parish. It forms the southern half of one continuous road line linking Sandford, Woodborough, Shute Shelve and so on. This route links two of the most important crossing points of Mendip - the Sandford 'Gap' and Shute Shelve - both of which are known from archaeological evidence to have been in use as routes across Mendip, certainly in Roman and probably in Prehistoric times and, therefore, this lane may be of equal antiquity. It provided a link between settlements and their seasonal grazing land on Sandford Moor. Secondary lanes joining Yadley Lane are: The Lynch (Saxon 'ridge'), which links the hamlets of Woodborough and Ford; Eastwell Lane, which occurs in Medieval documents, refers to a prolific big spring which must have been an important early cult centre; Church Lane (now known as Fullers Lane) is probably Medieval and this forms almost a crossroads with Yadley Lane and Eastwell Lane linking Winterhead and Sidcot with Winscombe and its church by a direct route; the Bridgwater Road has been a main road since Medieval and earlier times but prior to the 19th century, there were many small diversions eg. up Fountain Lane and through Sidcot village. Documentary evidence is lacking but the road certainly ran past Hale and over Shute Shelve and was virtually on its present line by 1792. It had probably been made with a turnpike road across the parish in the late 18th century and was still being improved in the 19th century. Here the coach road to Exeter went through with changes of horses at Cross and later the turnpike also took this route. There is still at least one milestone in the parish. Hangings took place at Shute Shelve in the 17th century. The earliest estate map of Winscombe was produced, on behalf of the Dean & Chapter of Wells Cathedral, in 1792. This map shows the regular plans of some of the settlements such as Barton, Sidcot and Winscombe with regular plots laid out along a lane or green. On this map the hamlet of Woodborough, now known as Winscombe, shows post-medieval cottages built around a common or green and "squatters" cottages erected on former waste land alongside roads. Most information for the farms and cottages can be taken from documentary evidence of the 16th-18th centuries in addition to post-1600 houses still remaining in the parish. Archaeological evidence shows that mining has taken place in the area since at least the Roman period. The first known documentary evidence for the extraction of lead ore in Winscombe is taken from mining licenses granted by the Dean and Chapter of Wells during the late 16th century. During the Commonwealth period the mines in Winscombe were owned by the State and in 1650 specific reference was made to 100 tons of lead ore being extracted from Woodborough Green during a 12 week period. There are still 'bell-pits' on Sandford Hill which probably relate to ochre mining there in early times. Sandford Quarry has been in existence since the mid 1800s. The carboniferous limestone of Sandford Hill was used in the construction of many large building projects such as Avonmouth Docks and several railway stations including Temple Meads, Bristol. This stone was also used for making lime, and many lime kilns can still be found in Winscombe. The largest, latest kilns are in Quarry Road but there are earlier small ones dotted about the parish near Star, Shipham Lane and Shute Shelve. The parish was last most drastically changed in the 1960s when many new housing estates and new roads were laid out. A new school was also built at Woodborough. These developments, in a short period, enlarged the settlements far more than had happened in the previous 1000 years. 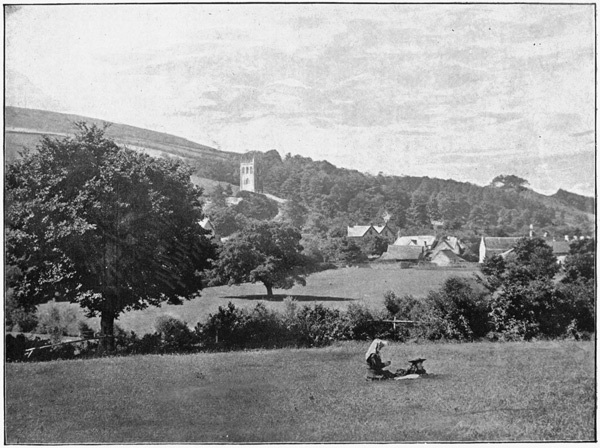 The view from The Award Land across Winscombe to Crook Peak is shown in this photograph. In 1799 land on the southern end of Sandford Hill, including part of the quarry, was awarded to the ecclesiastical parish so that parishioners could obtain stone to repair parish roads, that then being a duty of the parish. In 1922 there was some concern over the boundary line between the land being quarried for these stones and that of 'Sandford & Conygar Co', the independent quarry company. An agreement was reached and, as a result, all of the companies while working the quarry have paid the Parish the grand sum of £8 a year for use of the land – now called ‘The Award Land’. In 1993 the company working the quarry gave notice that it was giving up the tenancy and contested the ownership of the land it had been leasing from the Parish Council. It seems that the fact that rent had been paid for over 70 years was sufficient evidence to justify the Council's claim to the land. The agreement that resulted, signed in 1995, determined that the Parish Council owned the land and a forge, originally used in the installation of the steam-powered stone crushers and as a maintenance shop. Two kilns near the Award Land were in use during the Second World War, run by a team of Italian prisoners of war and quarrymen. On the other side of the hill, away from the Award Land, is Sandford Levvy, an adit driven deep into the hill in the search for minerals. This adit is where one Auxiliary Unit patrol planned its programme of sabotage in preparation for an invasion by enemy forces during the World War II. The Council decided in 1995 that the Award Land should be used as a nature reserve. Since that time many improvements have been made. Walks have been extended and footways, constructed. Fine views of Wavering Down and Crook Peak can now be enjoyed. The site has become much of an attraction.